Although supplying spare and replacement parts and providing repair services form the basis of many legitimate businesses, many manufacturing enterprises seek to augment the competitive advantage realized at the market stage of selling their main products by attempting to monopolize the market for spares, repairs and refills. Increasingly, companies are using intellectual property laws to devise up-front business strategies to gain exclusive rights in the components of their products. This is the first in-depth analysis of the law in this relatively new and rapidly developing area of practice. It sheds clear light on the conflicting interests of manufacturers, consumers, spare parts makers and the general public; explores the extent to which this kind of business strategy can be more or less successful with respect to the different rights involved, and in different jurisdictions; and highlights the competition issues that inevitably arise. The essays included are revised and updated versions of papers presented at the seventh (2006) of the innovative IP conference organized annually by the Macau Institute of European Studies (IEEM) on intellectual property law and the economic challenges for Asia. The authors give detailed attention to cases in various jurisdictions that have guided and continue to guide business strategies in the field. Jurisdictions treated include the EU, the US, the UK, Germany, the Netherlands, China, Hong Kong, Japan, and Korea. In its clarification of the limits and possibilities of business strategies in this area of competition that is just beginning to attract attention, this book will be of great value not only to intellectual property law practitioners but to business people in nearly any field of production, especially where cross-border marketing is involved. Preface. 1. 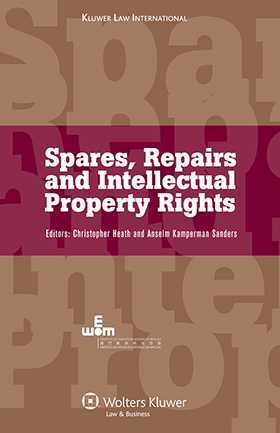 Rights Holders’ Control over Repair and Reconditioning; D. Llewellyn, V. Barresi. 2. Repair and Recycle between IP Rights, End User Licence Agreements and Encryption; E. Derclaye . 3. Repair and Recycle as Direct Patent Infringement? M. Mohri. 4. Repair and Refill as Indirect Patent Infringement; C. Heath. 5. Blocking Repair or Fair Use of Software? The US Perspectives on Anti-Circumvention; A. Sun. 6. Trade Marks and Reconditioned Goods in Greater China and at Common Law; M. Pendleton. 7. Repairs, Interconnections and Consumer Welfare in the Field of Design; A. Firth. 8. Antitrust Considerations: Refusal to License Intellectual Property in the US and EC; V. Korah.